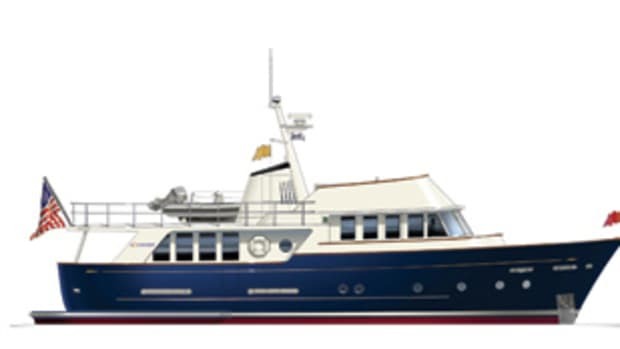 It&apos;s been a long time in gestation: Seaforth Marine built the first Tradition a few years ago, a lovely 54-foot prototype that has been redesigned, morphing into the flagship 58, slated to debut in Annapolis later this year. 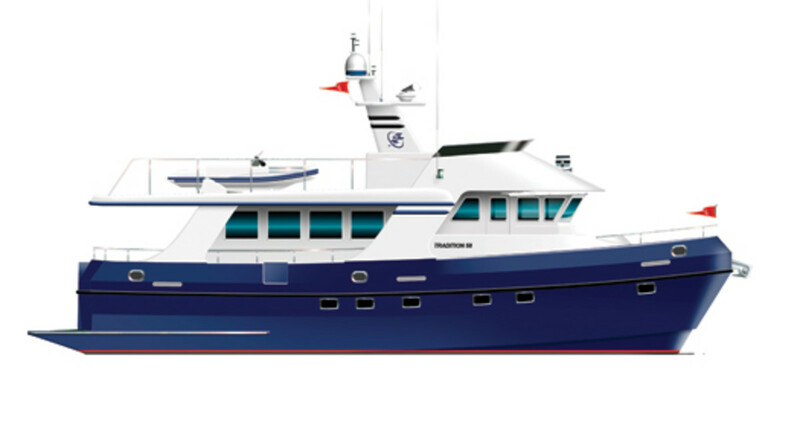 She&apos;s a serious long-range, deep-ocean passagemaker with robust, reliable mechanical systems and all the amenities necessary for extended voyaging. 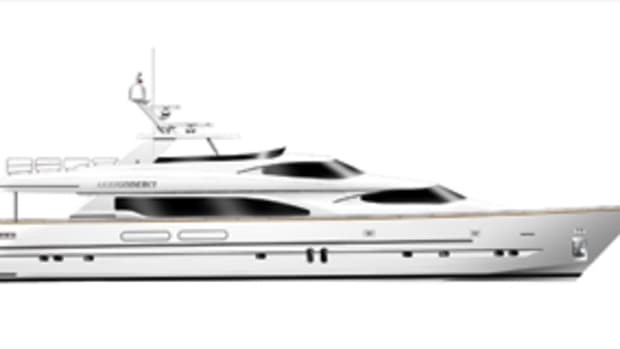 Her full-displacement hull form boasts transatlantic range, delivering more than 4,000 nautical miles at 7 knots on just 2,000 gallons of fuel. Yet, if need be, her Lugger diesel can push her to 11 knots and still cover more than 1,500 miles between fuel stops. 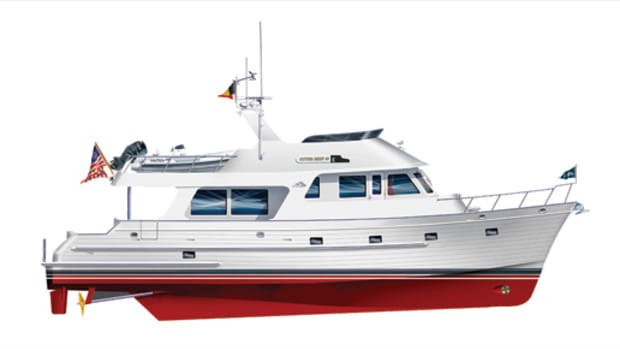 Standard equipment includes bow and stern thrusters and a Keypower 3500 get-home system for peace of mind. For comfort underway, she&apos;s fitted with Trac-250 fin stabilizers as well as Soundown thermal and acoustic insulation. A full-length keel protects her running gear, while her hard-chine midsections provide natural, passive damping to reduce roll motions. 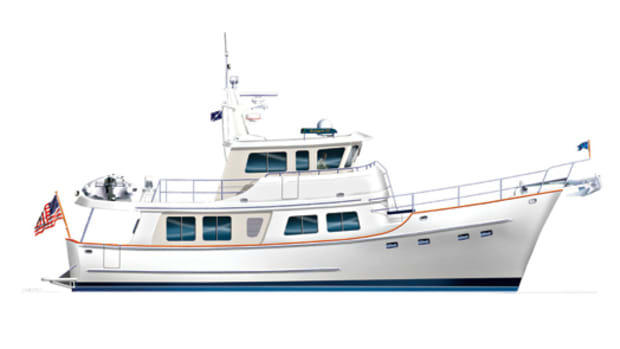 To withstand the rigors of ocean voyaging and the greater challenges of shoals and shifting shallows, she&apos;s built with a solid-fiberglass bottom and a Corecell foam-cored composite laminate above her chine. A variety of three-stateroom, two-head layouts are available, and each can be tailored. 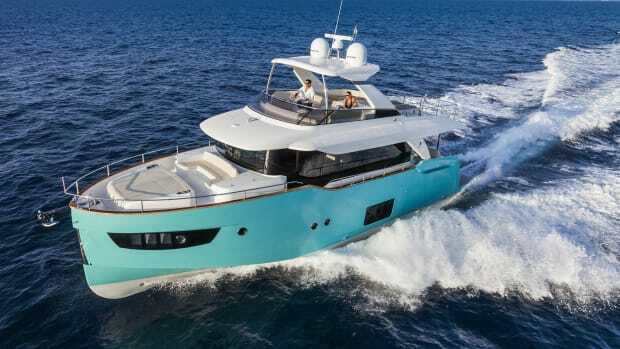 The first 58 will showcase a full-beam owner&apos;s suite amidships, with commodious en suite head offering a Jacuzzi tub. The two guest staterooms forward are separated from the owner&apos;s sleeping area by the master head and a passageway at the base of a stairway on the port side. 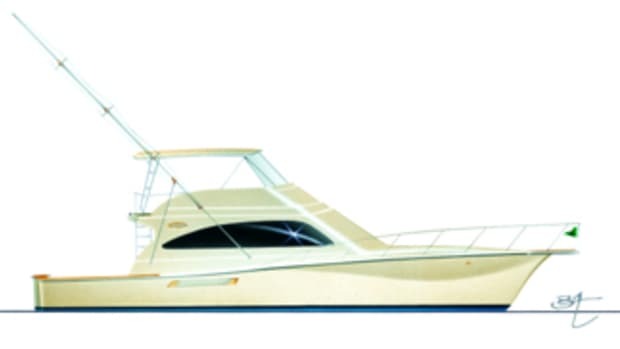 To maximize main-deck interior space, she has an asymmetrical saloon layout that creates space for an L-shape settee and a full-size refrigerator on the port side. To starboard is a wide side deck that allows unimpeded passage from bow to stern for easy line handling. 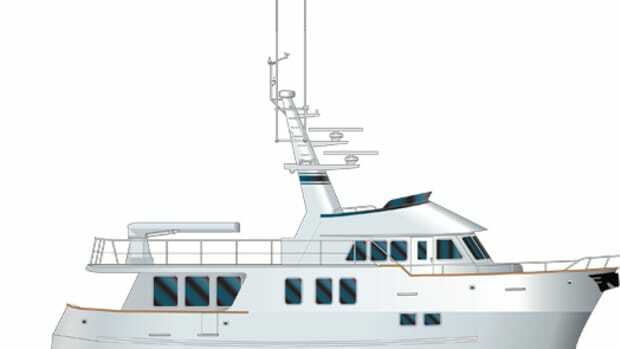 Outside passage along the port side is also possible, thanks to steps at both the forward and aft ends of the flying bridge. 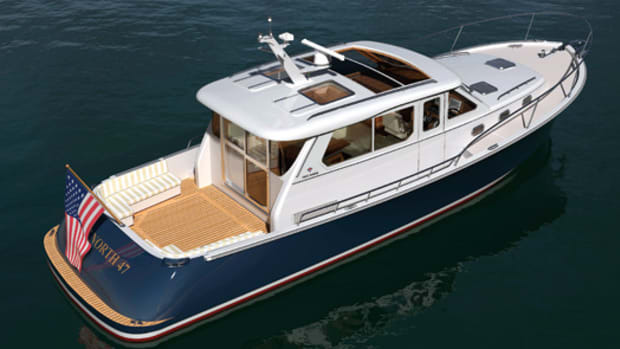 The pilothouse has a centerline helm with a companion seat and an L-shape settee for three or four guests. When the weather suits, there&apos;s a control station on the flying bridge and plenty of seating alongside. The Tradition 58 may have been a long time coming, but she&apos;s worth the wait. 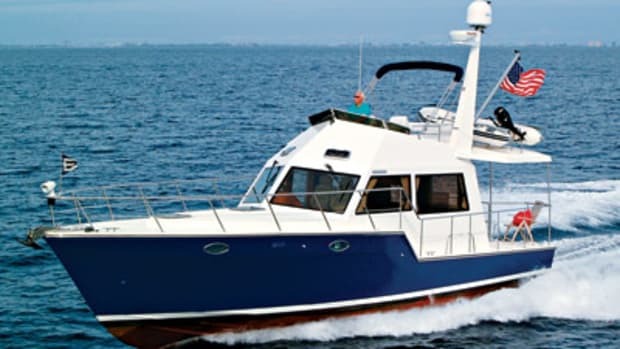 For more information on Tradition Trawlers, including contact information, click here.